If you’re an aspiring violin player, or a parent looking to enroll your child into violin classes soon, then this article is for you. I will share with you what you need to know about school and private lessons in Singapore. Read them before you enroll ! One of the most common methods of learning violin, or any other musical instrument, is to enroll into a music school. There are many music schools in Singapore. Without me naming any, you would have know a few big names who have centers in major shopping centers. 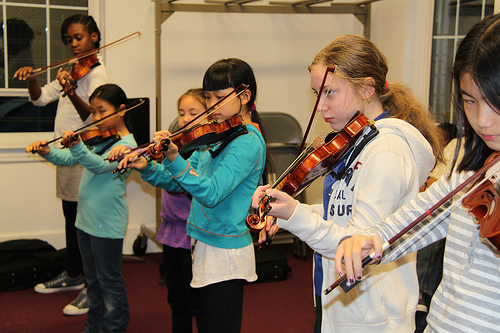 Most music schools teach violin lessons in groups, some vary from a small group of 3, some to even 6. Learning violin in a group is helpful as you can make friends who can learn the violin together with you. It can also build up your confidence as sometimes, you have to play in front of the group. As the group progresses, you can be also motivated to improve and keep up with the group. Most school lessons also follow a standard syllabus for students to follow and progress on, and hence, the students will also know which level of violin skills they are, and which level of playing they can attain from following the syllabus. Usually, the fees for learning in a group is also relatively cheaper than the fees for one-on-one private lessons. However, here are the downsides of having group violin lessons in music schools. As a violin teacher has to handle a group of students, the attention and focus is divided between the group of students. As a result, some students might be neglected, and hence, may not progress on the same pace as other students. The student may feel down and dejected, and may give up on the violin totally. Hence, I will recommend slower students to take up private one-on-one lessons so they can get their violin skills up on track again. Let us look at the advantages of taking up private lessons. Private violin lessons are given usually one-to-one, with a teacher’s full attention on teaching the student. With this 100% attention on the student, the teacher can customize the syllabus according to the student, one that can’t be done if it is a group class. The teacher can speed up, or slow down the syllabus based on the learning abilities of the student. Downside? Of course, private one-on-one lessons cost more than than group classes, as the teacher’s time and attention is focused solely on the student only. As it is also a one-on-one lesson, the student has reduced opportunity to know and make friends with fellow violinists (other than the teacher), but they can still do so by playing in orchestras, or knowing other violin students from other private classes. So now you may ask, which type of violin lessons in Singapore should you go for? I would recommend private violin lessons if you can, simply because you can have your teacher teach you according to your learning needs and abilities. And if you’re a serious learner, you will want to learn more, and progress as far as you can. You won’t want to be slowed down by other students in the group class. And if you are a fast learner, you learn more by having the full attention of the teacher. However, one reason most students prefer group classes in school is because of the cheaper lesson fees. That is also recommended if you’re intending to pick up violin just as hobby, and probably to learn just a few songs only. But if you want to progress further in your violin journey, then one-on-one lessons is highly recommended. That’s the basic information you have to know between school and private violin lessons in Singapore. Do you have any other queries on violin lessons? Comment below, and simply contact me here! Looking for violin lessons in Singapore for your kids? Check out how our violin teacher can help you!